People are quick with a plethora of excuses. I don’t have the time to cook and prepare my own food. Eating healthy is too expensive. Eating healthy is inconvenient and I’m too busy. I loooove food, and the healthy stuff doesn’t taste as good. In my mind, every excuse listed above is lame and weak — except, ok, maybe you aren’t a particularly talented cook YET, but some regular practice and dedication in the kitchen will definitely boost your cooking game. 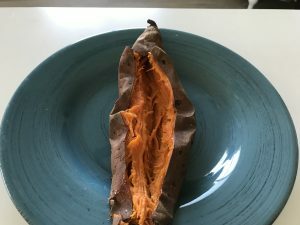 For today’s ForzaFit blog post we’re going to take aim at that last excuse — “the healthy stuff doesn’t taste as good” — and for Exhibit A we’re going to enter the scrumptiously salivating sweet potato. Now, it must be noted, a baked sweet potato probably isn’t going to win any beauty contests. Case in point, I snapped this pic of a purple potato shortly after it emerged from the oven (cooked on 425 degrees for between 45-55 mins). Ugly to the eye, beauty for the belly. A baked sweet potato is sort of the Shrek of the vegetable kingdom — quite akin to a marvelous book that ought not be judged by its unglamorous cover. Bake in the oven, remove for 5 or 10 minutes and let it cool off, but try to consume it while its still warm. Also, don’t throw away the skin!!! As with most fruits and veggies — the skin and outer layer is often packed with fiber and nutrients. In this particular case, eat the skin! I like to consume my baked potato still warm, with a dash or two of cinammon, and some Himalayan Sea Salt. I generally steer clear of any additional toppings because the sweet potato is bursting with flavor… but if you like, a teaspoon of ghee butter glazed over the sweet potato definitely massages the taste buds. WHY AM I SO BIG ON SWEET POTATOES? Because so many of the doctors, researchers and science pros that I trust most — Dr. Caldwell Esselstyn, Dr. Joel Fuhrman, Dr. Michael Greger, Dr. Dean Ornish, T. Colin Campbell, Dr. John McDougall and Dan Buettner of the Blue Zones Project — sing its praises. Potato is a certified staple of some of the (known) cultures that live the longest, such as the Hunzas in Pakistan, the Papua New Guineans, and the famed Okinawans of Japan. The Okinawans of Japan, during past decades when they produced a mind-blowing percentage of centerarians, consumed the majority of their calories (estimated to be 1,800 daily calories or so) from the purple sweet potato. 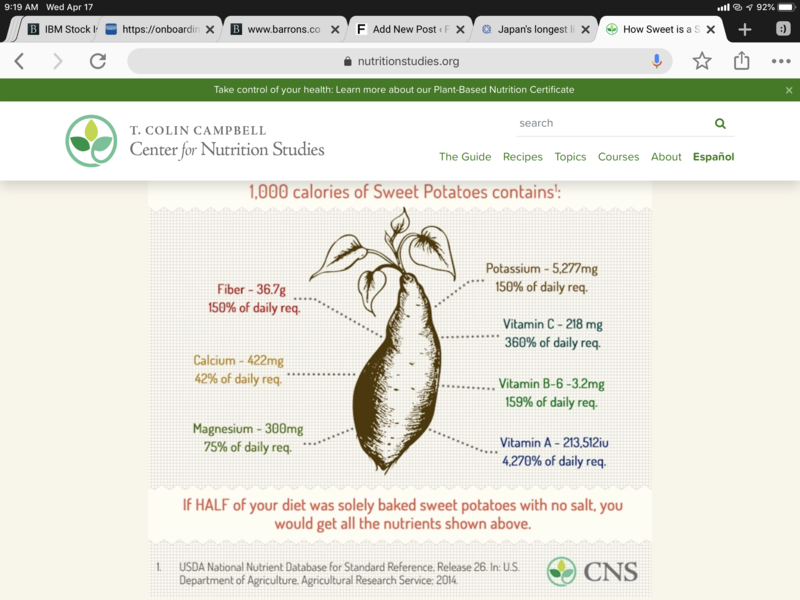 The Papua New Guineans, according to researchers such as Dr. McDougall and others, consumed roughly 90% of their daily calories from a wide variety of potatoes. 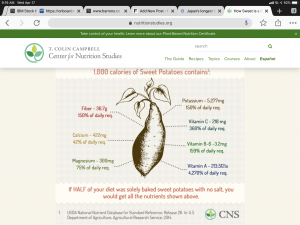 Sweet Potato nutrition profile and graphic courtesy of Center for Nutrition Studies and the USDA, U.S. Dept. of Agriculture. Sweet potatoes pack a wide nutritional punch, loaded with fiber, Vitamin A, magnesium, calcium, B6 and potassium. And they’re super affordable and easy to cook! If sweet potatoes are not a regular part of your nutrition lifestyle, I invite you to raise the bar and change that. A perfect food to satisfy your sweet tooth and love your body and mind at the same time. Frank Forza is a Las Vegas-based nutrition coach. He was one of the first 3,000 Brazilian Jiu Jitsu black belts in the world and is a 3x IBJJF Masters World Champion. His experience with weightcutting and eating for peak performance spans 30+ years and 300+ competition matches in wrestling, BJJ and no-gi submission grappling. He has competed at the prestigious IBJJF World Championships, American Nationals and Pan Games, with his bodyfat sometimes measured at roughly 5.3%. Frank has given two TEDx talks and was formerly Nutrition Columnist and interviewer for the Ultimate Fighting Championship. His work has been been published in major newspapers and TV programs around the world, including USAToday.com, FOX News, CNN.com, MSNBC, the Associated Press, ESPN radio, The Salt Lake Tribune, Las Vegas Review-Journal, Yahoo! Sports and Globo.com, among many others. Frank tailor-designs nutrition programs for clients such as busy professionals, executives and elite athletes. His clientele stretches from Los Angeles to New York City and he conducts sessions in-person, or via telephone, Skype, WhatsApp and Google Hangouts. To inquire about nutrition programs and coaching, please email frankie@frankieforza.com or call 702–237–9386.